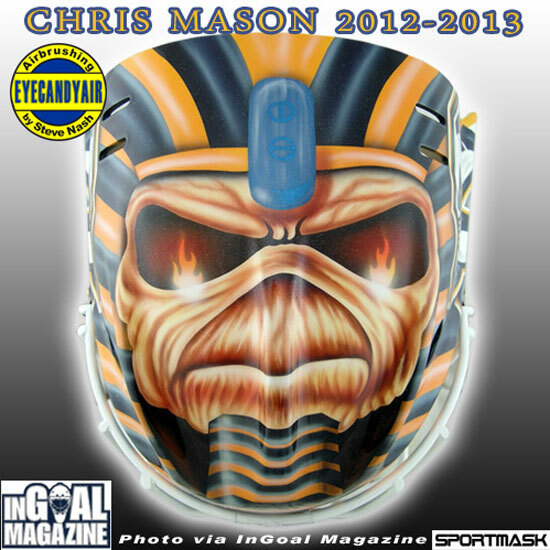 Nashville Predators backup goalie Chris Mason has unveiled a new mask for the 2012-2013 NHL season. Mason’s move from the Winnipeg Jets to the Nashville franchise meant new gear was in order, so the goalie hooked up with Steve Nash of EyeCandyAir. Maiden’s album covers were created originally by artist Derek Riggs, who has inspired Nash throughout his own career. Mason’s name is featured in the Maiden font across the front, which also features three Predators logos. The top of the mask has a full facial shot of Maiden mascot Eddie in all his “Powerslave” glory, while the backplate pays tribute to the city of Nashville. Mason also had a Maiden-inspired mask in Winnipeg, one that featured an image of Eddie via the “Aces High” single from the same album. Read more at InGoalMag here.